Remember me pining for pine forest a few weeks ago? The crew and I are in our new campsite in a Ponderosa pine forest! It’s 15 miles south of Flagstaff, on BLM land called Williard Springs. There’s a pond and a meadow of green grass dotted with white flowers. The BLT rests in the shade on a bed of pine needles. The PTV basks in the sun soaking up rays. I’m not kidding when I say it’s so lovely it makes me cry! Spike and Bridget think it’s wonderful. They are so excited by the new smells! Our camp is very private even though there are other campers here. Let me tell you about our day . . .
Around 8:30 this morning, after we’re almost finished breaking our Ash Fork Fields camp, I walk over to Rusty’s camp to say goodbye. I thank him again for the road atlas, for helping me, and for his friendship. He thanks me for the food and the camera. Then he advises me to be careful looking for a campsite because some of the roads are rocky and muddy. I tell him I don’t want to get emotional and so our goodbye, although heartfelt, is quick. I leave a small U.S. flag in the tree that the crew and I camped beside. The drive up to Williams is not as bad as I imagined it would be. At one point the PTV slows to 35 miles per hour right before we make it to the top. I don’t want to push the engine. Fortunately, traffic is light and easy. The directions I have for Lake Mary say to get off exit 195B. However, there is no 195B. It goes from 195 to 198. I get off at 198 and ask a workman in a truck how to get to Lake Mary. He tells me to go back to 195, head south and pick up Lake Mary Road. However, when I get off at Exit 195, it feeds the traffic right onto Highway 17 south and there’s no Lake Mary Road. Remembering the commenter on my blog who wrote about a BLM area called Willard Springs on Highway 17, I keep on driving. Our plans can change at any moment! Tomorrow I’ll write more about this day. P.S. A few minutes before posting this entry I called Rusty to let him know the crew and I arrived at our new camp, safe and sound. More about that tomorrow . . . . Many thanks to reader Jim Sathe who suggested this beautiful camp! I love it! 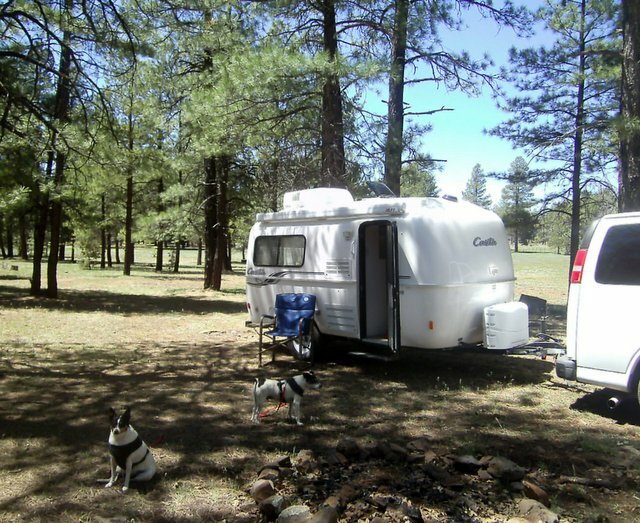 This entry was posted in Simple living and tagged Arizona, BLM, camping, casita, Flagstaff, nature, Ponderosa pine, Williard Springs. Bookmark the permalink. How absolutely gorgeous! Glad you’re relaxing. Hi, Karen . . .I think we’re about 6,300-6,500 feet up. It’s sunny and cool. You made it! You ain’t seen nothing, yet. You have no idea about the incredible places that are ahead of you. Enjoy your new “home”. I know I’m going to enjoy this camp very much. Beautiful! Wish we were somewhere near there…it looks very peaceful and serene. Enjoy. It is very quiet here. No road sounds, just the wind in the pines. One of my favorite places. Went to college in Flag back in the 60’s and that area south of town was one of my favs (and Sedona too – back then). I can smell the pine. I’ve missed the pine scent. The air fresheners don’t quite capture it! Pine scent air fresheners and new car air fresheners just aren’t like the real thing, are they? i love it! the desert photos showed an area a little sparse for my tastes…but this—perfect! enjoy it. I love the desert but I was ready for a change. I can tell I’m falling in love with this place, too. You seem to have found your next slice of heaven. Beautiful. Start asking about the White Mountains next since you are headed in that direction so far. Enjoy! I’ve heard talk about the White Mountains. They’re on my to-go list. I’m with Pat,,,Wish “I” was there !!! Absolutely beautiful! It looks so peaceful and serene there! Enjoy! I’m going to take a lot of photos tomorrow. There are a zillion trails around here. 🙂 seems all those “wrong” turns got you to the right place!!!! Looks wonderful! I made a wrong turn, tried to correct it, then made another wrong turn and then decided to keep going! SO glad your wrong turn brought you here…it looks SO lovely and inviting!! Hope it turns out to be a great place to be!! I may still make it to Lake Mary. For now this is wonderful! Looks wonderful. I would love to go there someday. Enjoy! I’ve had dreams about a place like this for years! Now that is MY kind of camping place. I can almost smell the pines…hear the breeze in the pine tops, smell the good earth…LOL….Yes I like that place. You did describe a place like this as more to your liking. It is lovely. Totally understand your feeling under the Pines. As much as we love the desert in the winter we sure love the pine forest we live in during the summer. Enjoy the soft pine needles on the ground, the wind whispering through the pine boughs overhead, the fresh pine smell, the dashes of dappled sunlight through the tall trees & the gentle quiet only a forested grove of tall pines can bring……..
You’ve described the wonder of this place, Al. It’s so restful here! Spike kept wandering off wanting to explore. He finally wore himself out. how nice to move from desert to beautiful cool pines in just a few hours! You are in a new habitat and it looks wonderful. I can feel the cool and smell the pine needles. I’m just so thrilled that you can just move from one habitat to another and have a beautiful front yard. This is what I’m yearning for if my life will ever get back to the kind of full timing I set out to do originally. So glad to have your blog to show me what I’m missing and enable me to make a list of the places I too want put out my mat. I’m happy to show you the places I find. It’s fun to share my excitement. I think I’d burst if I couldn’t! On one of your exploring jaunts without the PTV, try Walnut Canyon, east of Flagstaff. Very interesting, easy walk. No doggies, I think, ‘cuz it’sa monument. I think you mean without the BLT. If it’s no doggies, it’s no rvsue. . . boo hoo. Walnut Canyon isn’t a campground, it’s cliff dwellings and you can make it a quick trip just to walk around and get the gist of it, or it could become an all day visit for those dogless folk. It’s a very interesting and beautiful place. You can google it! This must look closer to the kind of habitat you are in . . . a lot closer than the desert! I want to hear how your drive went! I’m hoping you now won’t worry about the next hill up or down. 🙂 Glad you’re happy with your spot. I was in that area before the fires–nature renews itself. The pine needles make a place seem neat and clean, I think. As you can see from the updated post, the drive was easy and shame on me for worrying about it. I hope I’ve learned my lesson! I love stepping on pine needles right outside my door . . ..
Oh, that’s great, Sue. After a while you’ll just take the hills in stride–remember, they lead to beautiful places. Loved the pictures. Oh isn’t it cool to listen to the wind in the trees? (without worry about a storm at the same time?) That’s one of my favorite sounds even though I image a TRex stoming through at some point. sigh… too many Jurassic Park movies….. When I drove into this BLM area, I stopped the PTV and got out to walk the crew up the road in order to avoid going the wrong way, not being able to turn around, etc…. I opened the PTV’s door and the sound of the wind in the pines was exquisite. It’s hard to tell from your photo but I think thats the spot our group camped for Labor day last year. It’s Beautiful and peaceful…you will have visitors…cows graze the area. So glad you found your pine trees and you had an uneventful trip (with the BLT and Williams hill) . Enjoy!!!! I’ve seen some cow prints around. Yes, the trip was quick and easy. I did all that dreading for nothing! I fall asleep to the wind in the pines. Lovely. It happened to me today. I was tilted back in my anti-gravity chair looking up at the blue sky and pine boughs and bingo! I dozed off. When I woke up Spike was off socializing with a lady who happened to walk nearby! Bridget, of course, never left my side. Altitude that high puts me to sleep a lot too!! I have to go a much slower pace anything above 4,000 ft. or so…takes time for the body to aclimate. Enjoy the naps!! Wonder if the little doggies are any less energetic too? I felt the altitude once I arrived in NM. I was worried that Jack might be feeling it, as well, so I took him to a vet a few times and had them inject subcutaneous fluid just in case. One vet laughed and said she’d never had anyone bring a dog in for altitude sickness, but I told her since it was affecting me so badly, I thought it might be bothering him, as well. I made sure his gums didn’t feel tacky–think he did just fine. I felt lousy at times–short of breath, terrible headache, and very dry skin/nose. This would be the time you want to keep well hydrated and keep your skin moist. I was reading the other day that there is a medication to help. Wish I had known. We loved Willard Springs. From your pictures, you may have set up in the same place we set up in 2010. Enjoy. You willed me here! Thanks so much for your help. This is like a gift from you to me. Wait till you get a little rain – the smell will be wonderful! Glad you found such a neat spot. The rain is on its way, will probably be here by Thursday. Have you ever weighed your Casita since you filled it with stuff? No, I haven’t. I don’t have very much stuff in it. Most of my stuff is in the PTV. Might be a good idea to weigh both. Whether it’s in the trailer or in the van, the engine is still getting it up and down hills. JMO. Towing capacity is 5900 standard to 6500 maximum. The Casita Liberty Deluxe dry weight is 2,185. I took out the very heavy, big table that came with the BLT. About the heaviest thing I’ve put in are a few cans of food and dishes. I think I’m okay. If you are comfortable and it’s within the weight limits of your vehicle, then you ARE okay. I wouldn’t have known to weigh my tow vehicle and trailer separately and together unless someone suggested it in all the research that I had done before we started RVing. I wouldn’t have known to check my tires each time before towing. When I saw that you slowed to 35 mph near the top of the hill, I didn’t know if that was your own doing or whether it wouldn’t go any faster. I just read either in this blog or the last one after I had commented that you had done 8 years of research. Had I read it before, I wouldn’t have made any suggestions. No matter how much research you do , there’s always more to learn! Don’t hesitate to question or make suggestions. Reader’s comments help me a lot. I let the PTV slow to 35 mph rather than push it for an arbitrary speed and possibly heat up the engine, especially since I don’t have a working oil pressure gauge. The water temp stayed at the same temp as when the PTV is driving on flat land with no BLT behind. That’s where I wanted to keep it! Sue, you should have a sticker inside the driver door of your PTV. It gives you the numbers you need. I recommend to take aspirin before looking at it… you’ll need it. There is this site http://rvsafety.com/definitions-and-terms/ where you will find explanations. I am NOT a specialist but I attended a RV safety seminar with Walter Cannon a few weeks ago. The 12 people rating does not mean much. The car builder considers only one passenger of 150 lbs in the weight of the vehicle. Everything beyond that is cargo. There is a maximum weight for your PTV when it is loaded, including you and the crew. And a maximum weight for PTV loaded + BLT loaded when they are hitch together. Good luck! Hope that helps a little bit. Maximum towing capacity of the PTV is 6,500 pounds, and the BLT is probably no more that 3,000 pounds with full tanks.. The GVWR is 7,200. The PTV was built with another bench seat in it which has been removed. The major weight I’ve added is the solar panel and the 120 lbs of batteries. The accumulated weight of the rest of my cargo is not great. It’s bulky because of odd shapes of stuff, lots of air pockets! And like I’ve written elsewhere, the BLT has not gained a lot of weight since leaving the factory. I don’t have the weight of a furnace so that offsets the propane heater I added. Other than that, I have plastic storage boxes with clothes in them, a few dishes, pots and pans, groceries .. . probably close to the weight I removed when I took out the big table. I use the PTV as a closet so the BLT is kept light and neat. Sue, I really admire how you have all your numbers under control. I wish I could say the same…. Now add in all the “optional equipment”: TV, awning, Microwave. And then there’s the little item in the brochure that says the dry weight of the 17 foot Deluxe is 2480 lb. Not 2185. All that’s probably another 400 lbs. Which brings us up to sneezing range of 3000 lb. Not including any black or gray water. The Axle is good for 3500 lb. I don’t know about the 15 inch tires. It doesn’t take much in the way of equipment and personal goods to come up with another 500 lbs. You are probably still good to go. But wouldn’t it be better to know? A couple of years ago, before the advent of 15 inch tires put an end to the chronic nature of the problem, the biggest complaint on the forums was the 14 inch tires blowing up regularly. The only sensible conclusion is that people had no great trouble overloading these little trailers. Because they acted like Sgt. Schultz (“I see noth-ing!”), the first sign they had was when the tire blew at 70 mph. Nobody could understand it. I don’t think you have a problem. But if you are near a public scale sometime, it might be good to spend 10 bucks and find out for sure. You can get several weights on one ticket. Drive forward until only the truck is on the scale, and you get the weight of hitch and truck. Drive forward to the center to get both trailer and truck. Stop as the truck wheels leave the scale and let the jack take the weight off the ball – that’s the weight of the trailer alone. 10 minutes and you’re done. The rest is just math. Well, I made a stupid math mistake while blathering blithely on about the propane. You probably saw it. The propane you carry is in the range of 40 lb. Not 128. Love your new home site. Enjoy the new adventure. Good morning, Slyvia. All’s quiet in the forest this morning. Oh, the magic of Arizona! You can be in the hot desert floor, and a couple of hours later up in the cool mountains. I know you did a ton of research before embarking upon your new life. You could not of picked a better place to do it. So many of us following you are wishing we could be there! Keep on rocking girl. Arizona is ideal for fulltimers. Yeah, I did a lot of research. Eight years of reading blogs, going over rv/travel trailer specs, looking up government websites, making lists, studying maps, asking questions, visiting forums, on and on and on! It kept the dream real. But it’s a lot more fun doing the real thing! What a beautiful spot you found! Glad your travels have brought you there to relax and refresh among the pines. I was thinking of you yesterday, wending your way up those hilly, wind-y roads, so it’s good to know you arrived without a problem. Just got back from walking Bridget and Spike for their potty break. I had to run after Spike because he wants to visit campers . . . before 8 in the morning. It looks like a cloudy day which makes the forest seem even quieter. You have a great day! What a difference a day makes! Absolutely Beautiful! It is a lot different, isn’t it. I would have come here sooner but weather got in the way! I hope you do come here someday, Grace. It’s not far for you, is it! Ooh. . . Does this mean I’m annoying people with my compulsion to reply? Oh, Sue, annoying? Heck, NO! My folks sold their Munds Park motorhome five years ago, but as I recall the last time I was there, the elk were also showing along the freeway going north toward Flag. they like to hang out in the meadows, but also in the dry lakes around there. Just ask around. You’ll find them, mostly at dusk. Take your binoculars and a comfy camp chair to view from a distance. I’m going to have to take some time to go off somewhere in the PTV, park, sedate the crew (just kidding) and wait to see what comes by. Hi Sue, I had relatives in those there parts. My Grandmothers sister and her family lived there. Her daughter still lives there. Her name is Dawn Borrowmen. Have you seen any Roadrunners? I still have a pin that she sent me when I was a kid of a Roadrunner. Miss you…. I saw a roadrunner when camped near Wickenburg, the camp where I took photos of horses. As we were leaving the camp to go somewhere new, a roadrunner ran across in front of us. I laughed thinking, hey, we’re roadrunners, too! I miss you, too. I’m always happy when your name pops up here. Am I driving you crazy? You wouldn’t be the first. I’m not sure I understand your comment really well. I haven’t taken care of this because I’ve been in places where there is no Wal-Mart, no Napa, no Auto Zone. Gee, I’ve been lucky to find a decent grocery store. And when you sit in one spot for days on end, a oil pressure gauge tends to fade in importance. As it is, I’m glad I didn’t take care of it. I’m not going to have the cluster assembly done. I’ll get one of those high falutin’ scan gauges (see RVing Resources page). Is that what you mean? I’ve been teasing you, Mister Ed. I appreciate your concern for my auto safety.